It’s unusual for Kimberly Gatto to be on the receiving end of questions. 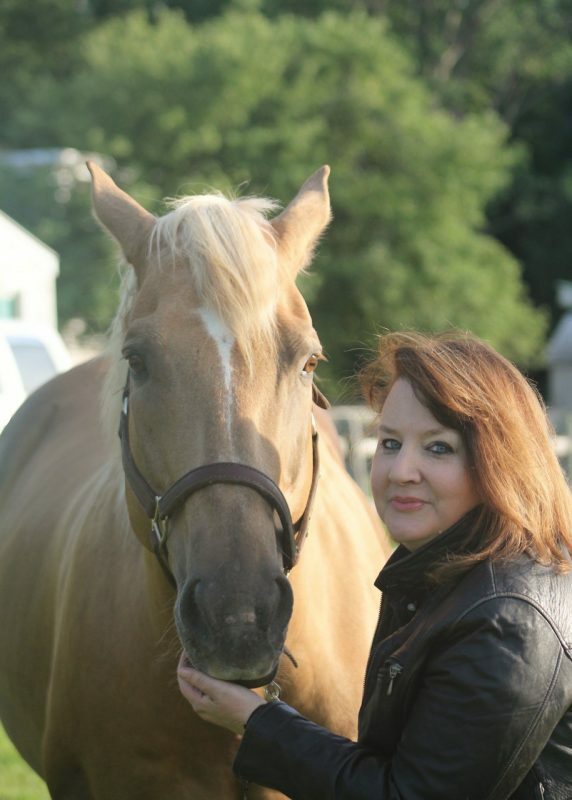 An accomplished author and lifelong horsewoman, Kimberly is more likely to be found in the interviewer’s chair, researching for one of her many non-fiction tales. 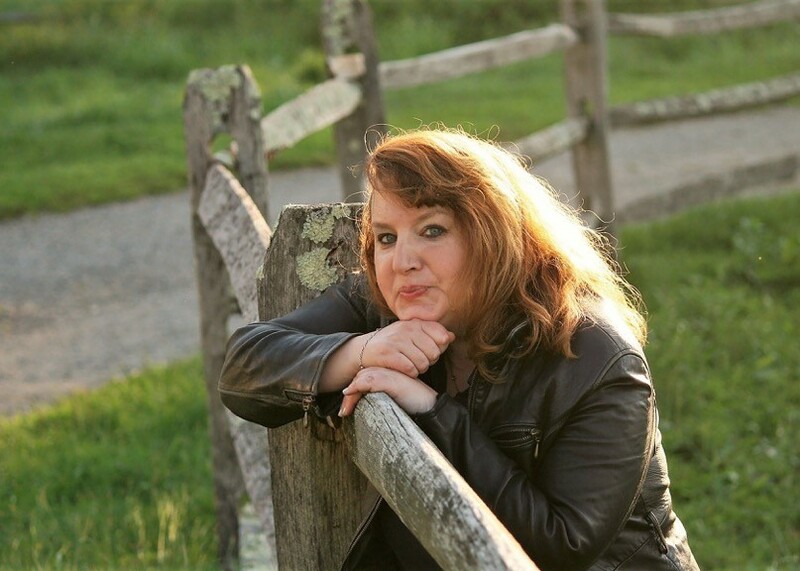 She’s written about the world’s most famous racecourse in “Churchill Downs: America’s Most Historic Racetrack.” Her research and writing for “Beyond the Rainbow Bridge” has helped horse lovers cope with and heal from the loss of their four-legged counterparts. And “Sandsablaze” tells the tale of a little American Thoroughbred who carried Buddy Brown from medal finals all the way to the Olympics. Kimberly and Flash. “Horses have taught me a lot, but most importantly, they’ve taught me to never give up,” she said. Kimberly’s portfolio reads like a “Who’s Who” of the equestrian publishing realm. 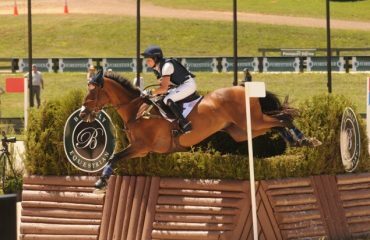 Her byline has been found between the pages of The Bloodhorse, The Chronicle of the Horse, “Chicken Soup for the Horse Lover’s Soul” as well as Sidelines magazine. There are 15 non-fiction titles bearing her moniker on the cover, dating back to her first release in 1998, “Michelle Kwan: Champion on Ice.” Kimberly’s latest book, “All the King’s Horses: The Equestrian Life of Elvis Presley,” a collaboration with Victoria Racimo, was released in August 2017. A writer for a financial corporation by day and researcher and award-winning author by night, Kimberly is on the hunt for book number 16. As a 5-year-old, when most kids were dreaming of becoming crime fighters and veterinarians, Kimberly dreamed of being a writer. The budding author experimented with poetry at 6 years old, prompting her mother to enroll Kimberly in after-school creative writing classes. Later, Kimberly attended the Boston Latin School, learning Latin, German and Greek, as well as nurturing her love of literature. Her favorite author at that time was William Shakespeare; she eventually named her first horse As You Like It after one of the literary hero’s famous comedies. She followed up the Boston Latin School with a stint at Wheaton College, where she studied creative writing and psychology. And while her education has certainly supported her writing, Kimberly said nothing has helped her develop her skills more than putting pen to paper. With 15 titles to her name, Kimberly is better known for her work in the non-fiction genre than her poetry, but she still digs deep for poems when the mood strikes. A different kind of inspiration is needed to write a book. To call the process of writing a book long and challenging is an understatement. But is it worth it? To see your vision come to life, absolutely, Kimberly said. It takes Kimberly about a year or two to complete a book. In that time, she locates and restores photographs, seeks out old news clippings, interviews relevant connections and, eventually, writes. She works late into the night and early in the mornings. She needs complete silence, choosing to write from home or the library, away from the distraction of music, TV and her two cats, Coal and Buster. Her third cat, Donovan, lives at the barn. Kimberly had her first taste of the equestrian life when she was 13 years old, mounted aboard a trail horse at a pal’s birthday party. One celebratory trail ride was all it took. 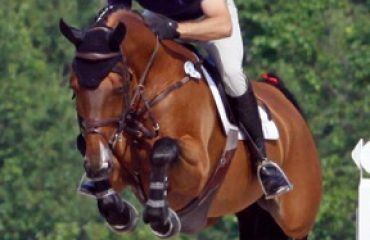 She started riding lessons shortly after, eventually purchasing a pony, embarking on a show career and poring over the pages of George Morris’ “Hunter Seat Equitation” at night. It was the little Thoroughbred mare named As You Like It — dubbed Chutney — that turned Kimberly into a horsewoman. Kimberly showing Chutney many years ago. The beloved mare was her four-legged inspiration behind two of her successful books. “The relationship with the horse is most important to me,” Kimberly said. 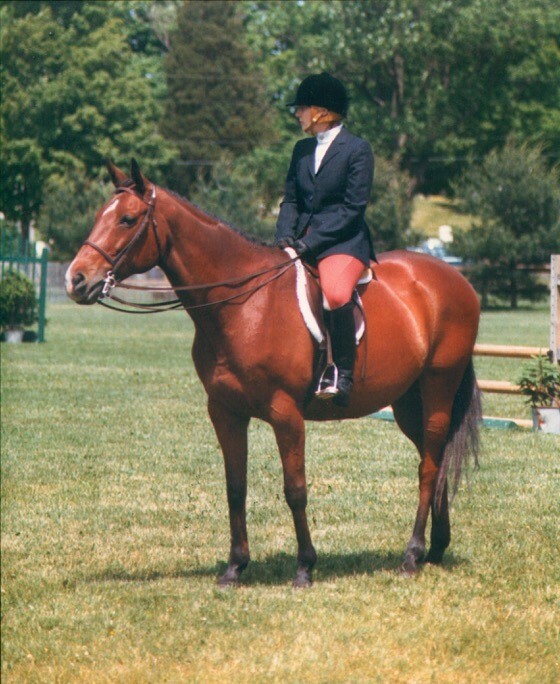 “My horse Chutney was very talented, but you had to be a quiet rider — she was tough and she was hot. Over the years, a few trainers would tell me that Chutney and I were not good together, but the partnership between us was so important to me that I grew to ride her well and consistently. Kimberly boards her two current horses: Flash, a palomino who’s roughly 14 years old, and 23-year-old Grace, an off-track Thoroughbred Kimberly rescued as a 4-year-old. 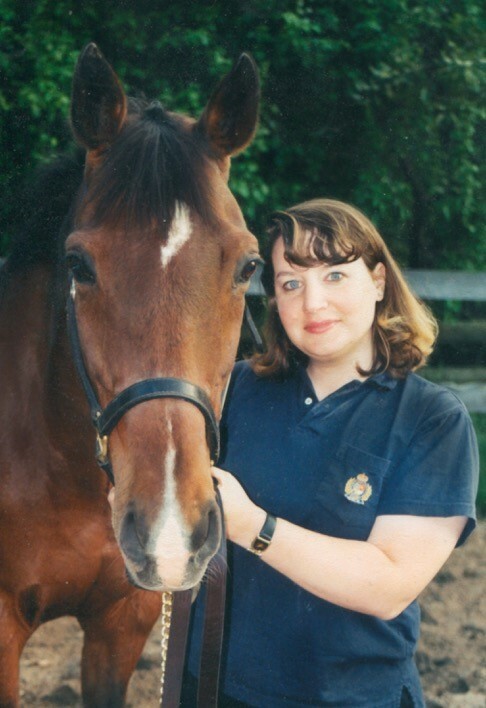 Kimberly rides for pleasure now, and spends nearly every morning and evening caring for and doting on her two horses. “Horses have taught me a lot, but most importantly, they’ve taught me to never give up,” she said. 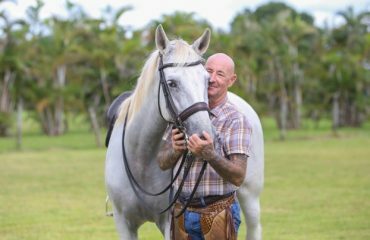 Kimberley’s mare Chutney, now deceased, inspired her to write “Beyond the Rainbow Bridge” which has helped many horse lovers cope with and heal from the loss of their four-legged friends. Typically, it’s a central muse that inspires Kimberly to begin her research. For “Sandsablaze,” it was an unforgettable photograph of a 1973 AHSA Medal Finals win at Harrisburg that stirred her passion. For “All The King’s Horses,” it was a combination of her fondness for Elvis Presley’s music and her discovery of The King’s horsemanship that sparked her interest. While the passion kicks off the writing process, it’s the storytelling that keeps Kimberly churning out books. Belair Stud, an American Thoroughbred racing stable and breeding farm based in Maryland, was the subject matter of what Kimberly described as a story that needed to be shared in “Belair Stud: The Cradle of Maryland Horse Racing.” Her hard work presenting the story of a stable that owned two Triple-Crown-winning horses has garnered her some acclaim, including three different awards. Success can be measured any number of ways, but for Kimberly, it’s not about book sales and awards, although she’s achieved both those things. Most recently, “Belair Stud” was the recipient of the 2018 Prince George’s Award of Excellence, “All The King’s Horses” won the Whinney Award at the 2017 Equus Film Festival and “Sandsablaze” was recognized with a Feathered Quill Silver Medal in 2015. 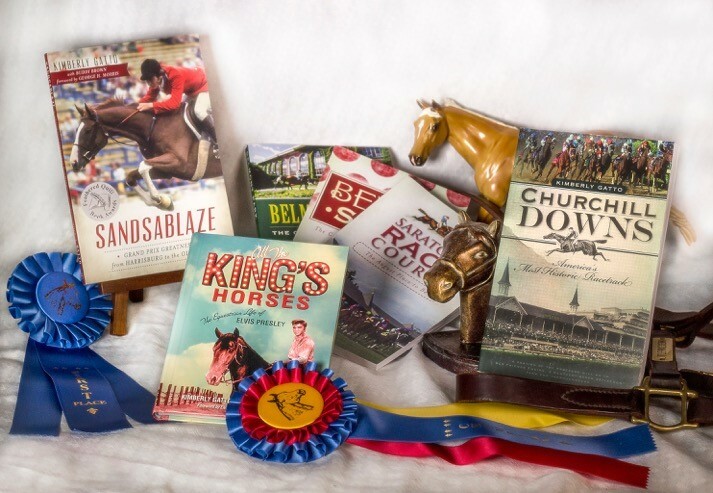 Instead, she tastes her success in the notes from touched readers, the phone calls from icons and catching glimpses of her stories sitting on the shelves of the Churchill Downs gift shop. He loved it. So did William Steinkraus and Michael Matz, who were also idols of a young Kimberly. It’s tough for Kimberly to choose a book she’s most proud of, as each story comes to life in its own way. But she holds “Beyond the Rainbow Bridge” close to her heart. It’s one she re-read herself to heal following the death of a horse.